The Cooperative Research Centre for Landscape Environments and Mineral exploration closed on June 30th 2008. Responsibility for research activities passed to individual core party participants. The LEME website will be maintained by CSIRO Exploration & Mining for a 5 year period, after which it will be removed. Hard copy publications are no longer available. All publications are available for free electronic download as PDF versions from this website. 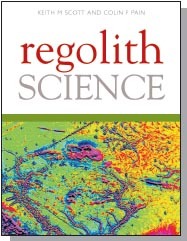 Dr Neil Williams, CEO of Geoscience Australia, launched this comprehensive reference on the fundamentals of regolith geoscience in Novmber 2008 at Geoscience Australia headquarters in Canberra. The book describes how regolith is developed from parental rocks and emphasises the importance of chemical, physical, water and biological processes in regolith formation. Written by experts in the field, Regolith Science summaries research carried out over a 13 year period within CRC LEME. The book is now available from CSIRO Publishing. Team and individual awards were presented by Board Chair George Savell and CEO Steve Rogers at Presentation Dinners held in Canberra, Adelaide and Perth at the end of June, to mark the official closure of LEME on 30 June 2008. LEME Head Office will remain in operation for a few months, to finalise annual reports, legacy publications, financial audit and archiving. This story featured Dr Robert Hough - CRC LEME / CSIRO Exploration and mining. Surprisingly little is known about gold nuggets. How do they form, where do they come from and do they hold clues to finding more gold? An enterprising geologist in Western Australia has teamed up with the owner of one of the largest private nugget collections in the world to try and answer these questions. Catalyst journeys through the West Australian goldfields in the quest to find the very origin of nuggets. This story featured LEME's Researchers Dr Ravi Anand (CSIRO Exploration and Mining) and Dr Steve Hill (University of Adelaide). There's no doubt that one of Australia 's greatest economic resources is mineral ores. However, finding ore bodies is an expensive and sometimes environmentally destructive process but, as Paul Willis (Catalyst reporter) finds out, scientists are now learning a lot about what lies beneath, by studying what thrives above – trees; termites and even kangaroo poo. Describes how LEME biogeochemistry is providing signatures to buried mineralisation, with comments from CEO Dr Steve Rogers "Though Australia reaps a rich reward from its rocks, its proportion of global investment in exploration for minerals is dropping ...... between 2005 and 2007 Australia's share of the global expenditure descreased from 19 to 13 per cent"
It features Research from LEME University of Adelaide PhD students Anna Petts (termites) and Nathan Reid (spinifex), supervised by Dr Steve Hill. This is part of the LEME Program 1 Tanami Project. Anna comments "Over the next few years we will see an explosion of papers and results looking at discoveries of previously unknown mineralisation, using plants and animal soil sampling regimes"
The article also summarises the Predictive Geochemistry and biogeochemical exploration research undertaken by Dr Ravi Anand and team (CSIRO Exploration and Mining), as part of the AMIRA Project 778 (LEME Program 2). Sponsored by a number of mining companies, the team are seeking 'definitive results'. Ravi notes that "Biogeochemistry has been under-utilised in Australia, and is showing promising results. While drilling targets a very small area, checking it with plants and termites allows for mineral prospectivity on a regional scale. That is important because regional exploration is how new discoveries will be made". Science article and book highlight how soil science helped solve a crime. Keynote address at 19th Int Geophysical Conference by LEME Program 1 Leader, Ms Lisa Worrall receives award from ASEG for Best Presentation. Strong representation from LEME presenters. LEME/CUT sponsored PhD student Kirsty Beckett receives award for Best Poster. 5th Sprigg Symposium. Regolith: Mineral deposits and environment. Fourteen LEME presentations. PowerPoint files available to download.